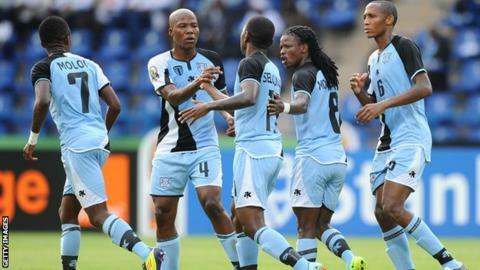 Between 2010 and 2012 Botswana’s national football team was on the up – achieving its highest ever world ranking and a place at the Africa Cup of Nations. Now as 2018 draws to a close the Zebras are not far off their worst ever global ranking and without a single win in qualifying for next year’s Nations Cup. Former striker Dipsy Selolwane, current coach David Bright and football association president Maclean Letshwiti all have their ideas on how to improve the Zebras’ fortunes. Botswana made history in 2012 when they qualified ahead of Tunisia, Malawi, Togo and Chad for their first, and so far only, Nations Cup finals in Gabon and Equatorial Guinea. The achievement raised the expectations of fans that Botswana would build on the foundations laid by local coach Stanley Tshosane. The retired soldier was not many people’s first choice when he was named in 2008 but he marshalled a determined and talented team to relative success. Two years after he took charge his team that included the likes of Diphetogo ‘Dipsy’ Selolwane and the country’s all-time leading goalscorer Jerome Ramatlhakwana had moved from 117 on Fifa’s world rankings to an all-time high of 53. The period also saw an unprecedented number of local players sign for South African clubs. However the qualification did not lead to further success; first they lost all three games at the 2012 finals and then failed to qualify for the tournament a year later as they were thrashed 7-1 on aggregate by Mali in a shortened qualifying campaign. Further disappointment followed: a poor showing at the regional 2013 Cosafa Cup, failure to reach the last round of 2014 World Cup qualifying and missing out on the African Nations Championship (CHAN). As the Zebras’ started on their journey down a dark tunnel Tshosane was sacked in 2013 with his replacement Englishman Peter Butler, temporarily restoring some hope. As well as wins in 2015 over Mali and Burkina Faso he lead them to a first ever Cosafa Cup final a year later but that was coupled with a failure to reach the 2017 Nations Cup finals. The decline in results saw the BFA decide against renewing his contract in 2017 and lead to the return of Bright as coach, who has been unable so far to change the Zebras results. Bright argues that the number of foreign coaches at clubs in Botswana, some of whom have not added value, has affected the progress of the local game. “If you look at it, there are too many foreign coaches, and this has affected the style of our players,” he told BBC Sport. In recent years there have been as many as 10 top-flight clubs out of 16 with foreign coaches but that trend seems to be changing with six at the moment. Selolwane, regarded as one of the finest players to emerge from Botswana, believes the leadership should involve former players in the national team set-up, in order to improve results. “There is a need to regroup and salvage the generation that qualified for the 2012 Nations Cup finals,” he urged football authorities. He agrees with Bright that more players need to go overseas which would ultimately enhance the quality of the national side. “The more we export players, the better the Zebras will be. International exposure helps develop our football,” he insisted. “We have to aspire to be the best and you cannot be the best when you are playing locally,” said Selolwane who played for Santos, Supersport and University of Pretoria in South Africa’s top league. Former coach Butler believes the BFA has to go back and look at the development program which he introduced. “It is a 10 year program providing a conveyor belt of talent,” he insisted. Current BFA president, Maclean Letshwiti is of the view that grassroots development will bring lasting results. He anchored his 2016 presidential campaign on development and has said there is no shortcut to success. “The future is development, that is why my administration has established junior leagues across the country,” Letshwiti said. For now though the Zebras are deep into a dark tunnel after the light of 2012 and their only target is to try and restore the tiniest amount of pride with a win in their final 2019 Nations Cup qualifier. At present they are in real danger of finishing the campaign without a win ahead of final Group I game in March next year against visiting Angola, who know a win will guarantee them a place at next year’s tournament.